I decided one Easter, while swinging on the swings, that it was officially going to be my favorite holiday. It's perfect. Great weather, the Easter Bunny comes, new church dresses, egg hunts, yummy food, and last but not least, jello eggs. I love me some jello eggs. Of course, once the 4th of July rolled around, I decided that it would be my favorite holiday. After that, Halloween. I like holidays. All of them. Easter and Christmas however, hold their own special and sacred meanings to members of our Church as well as people all around the world. And as fun as Halloween is, it could never come close to Christmas or Easter. A time to every purpose. A time to break down - a time to build up. A time to get... a time to lose. AND... remember that trials aren't permanent. If you are faithful and trusting, they will go away eventually... even if it isn't until your earthly life is over. Always remember that "This too, shall pass." "I think of all the days since the beginning of this world's history, that Friday was the darkest. 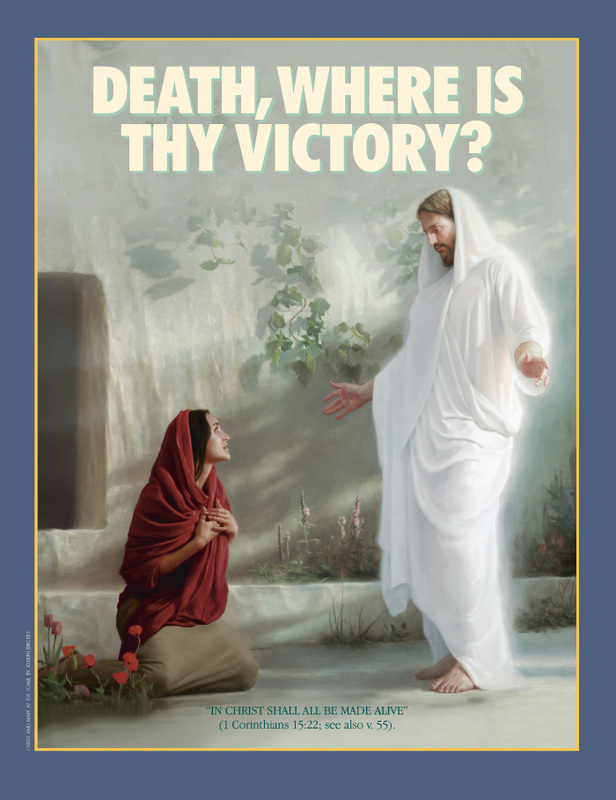 But the doom of that day did not endure because on Sunday the resurrected Lord burst the bonds of death, ascended from the grave, and appeared gloriously triumphant as the Savior of all mankind." "Each of us will have our own Fridays -- those days when the universe itself seems shattered and the shards of our worldly life littered upon us in pieces. We will all experience those broken times when it seems we can never be put together again. But I testify in the name of the One who conquered death -- Sunday will come. 3- He is despised and rejected of men; a man of sorrows, and acquainted with grief: and we hid as it were our faces from him; he was despised, and we esteemed him not. 4- Surely he hath borne our griefs, and carried our sorrows: yet we did esteem him stricken, smitten of God, and afflicted. 5- But he was wounded for our transgressions, he was bruised for our iniquities: the chastisement of our peace was upon him; and with his stripes we are healed. Christ suffered more terrible pains than we could ever imagine. He did it for me. And you. He gave us the atonement, so that if we did our part and repented, we would never feel of those pains. And then, on the third day, He rose again. He conquered death. He rose above death... so that we could too. And He succeeded... even though He went through great adversity. Following His example, WE can succeed amid great adversity too. AND, perhaps the most significant knowledge that we gain from Easter... is that we can and will be resurrected someday... with a perfect body. Families... are FOREVER. That means so much to me... and I'm sure it does to you if you have lost loved ones. 6- He is not here: for he is risen, as he said. Come, see the place where the Lord lay. "Our Savior lived again. The most glorious, comforting, and reassuring of all events of human history had taken place—the victory over death. The pain and agony of Gethsemane and Calvary had been wiped away. The salvation of mankind had been secured. The Fall of Adam had been reclaimed. The empty tomb that first Easter morning was the answer to Job’s question, 'If a man die, shall he live again?' To all within the sound of my voice, I declare, If a man die, he shall live again. We know, for we have the light of revealed truth." And with that, Happy Easter!